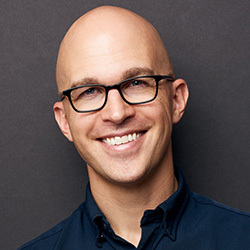 "The title could have been How to be an All-Around Optimized and Awesome Human Being... I think anyone and everyone living in our modern world would be well-served by reading this book... I got the Audible edition, bought the Kindle edition to read along with, and just ordered the print copy so I can make lots of notes and refer to it often. If buying the same book three times isn't compelling evidence of this book's value, then I don' t know what is! Read it. Now." How to make good business decisions. How to manage uncertainty and ambiguity. How to conduct intelligent experiments to improve your results. The Personal MBA is designed to help learn the art of business on your own terms. Instead of mortgaging your life to go to business school, it's possible to dramatically increase your knowledge of business on your own time and with little cost – without setting foot inside a classroom. With a little time and effort, you can easily learn these skills on your own, without eye-popping tuition and student loans. How businesses actually work – in practice, not theory. How to evaluate new business ideas: what really matters, and what doesn't. How to start a new business from scratch. How to improve any existing business, whether it's a solo venture or a Fortune 500 corporation. 4 Methods to Increase Revenue: There are only four ways for a business to bring in more money. Do you know what they are? True leaders aren't made by business schools — they make themselves, seeking out the knowledge, skills, and experience they need to succeed. 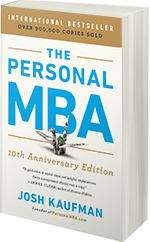 Read The Personal MBA, and you'll learn the principles it takes most business professionals a lifetime of trial and error to master. The Personal MBA recommended reading list is the tangible result of thousands of hours of reading, research, discussion, and evaluation. Each book in the list has been selected for a single purpose: to maximize your educational return on invested time. The Personal MBA is designed to help you educate yourself about advanced business concepts. This manifesto will show you how to substantially increase your knowledge of business on your own time and with little cost, all without setting foot inside a classroom. The Personal MBA is an introductory business primer. Its purpose is to give you a clear, comprehensive overview of the most important business concepts in as little time as possible. The vast majority of modern business practice requires little more than common sense, simple arithmetic, and knowledge of a few very important ideas and principles. Every successful business creates something of value. The world is full of opportunities to make other people’s lives better in some way, and your job as a businessperson is to identify things that people don’t have enough of, then find a way to provide them. Offering value is not enough. If no one knows (or cares) about what you have to offer, it doesn’t matter how much value you create. Without marketing, no business can survive — people who don't know you exist can't purchase what you have to offer, and people who aren’t interested in what you have to offer won't become paying customers. Every successful business ultimately sells what it has to offer. Having millions of prospects isn't enough if no one ultimately pulls out their wallet and says, "I'll take one." The sales process begins with a prospect and ends with a paying customer. No sale, no business. Every successful business actually delivers what it promises to its customers. There’s a term for a person who takes other people’s money without delivering equivalent value: "scam artist." Finance is the art and science of watching the money flowing into and out of a business, then deciding how to allocate it and determining whether or not what you’re doing is producing the results you want. Businesses are built by people for people. Understanding how we take in information, how we make decisions, and how we decide what to do or what not to do is critical if you want to create and sustain a successful business venture. In today’s busy business environment, it’s easy to get stressed about everything that needs to be done. Learning how to work effectively and efficiently can be the difference between a fulfilling career and a draining one. Working with other people is an ever-present part of business and life: you can’t escape it, even if you want to. If you want to do well in this world, it pays to understand how to get things done with and through other people. Businesses are complex systems that exist within even more complex systems: markets, industries, and societies. A complex system is a self-perpetuating arrangement of interconnected parts that form a unified whole. Before you can improve a system, you must understand how well it's currently operating. Unfortunately for us, that’s tricky business: it's not possible to stop the world however long you want while you take careful measurements. Systems must be analyzed as they’re working. Creating and improving systems is the heart of successful business practice. The purpose of understanding and analyzing systems is to improve them, which is often tricky: changing systems can often create unintended consequences. "No matter what they tell you, an MBA is not essential for landing or handling a good business job. If you combine reading this book with actually trying stuff, you'll be far ahead in the business game." "The comprehensiveness here is truly impressive. Josh has synthesized the most important topics in business into a book that truly lives up to its title. It's rare to find complicated concepts explained with such clarity. Highly recommended."